Receive gentle treatment for gum disease at Kensington Dental Office in Brampton! According to the Canadian Dental Association, seven out of every ten people in our country will develop gum disease. This dental problem is the most prevalent among adults in Canada, the United States, and in numerous countries around the world. One of the major factors in the progression of gum disease is its subtle nature. In its early stages, when there is the opportunity to reverse damage, infection in the soft tissue around teeth is barely detectable. No pain occurs from gum disease. Symptoms may not be obvious until there is a real problem, one that requires extensive treatment to remedy. Another dangerous aspect of gum disease is its potential to affect general health. Most people know that gum disease can cause tooth loss, but little may be known about other risks. Research has identified bacteria from gum disease as a potential factor in other health conditions. The bacteria (called spirochetes) have been found in crucial areas including the heart and the brain. Recently, forms of bacteria found in diseased gums have been identified in the brains of Alzheimer’s patients. Is it possible that gum disease causes other forms of disease? We do not know enough to say without a doubt. However, we do know that bacteria can travel from the mouth into the lungs, digestive system, and to all parts of the body via the bloodstream. This evidence is sufficient for Dr. Joshi and his team to work hard to prevent and treat gum disease. 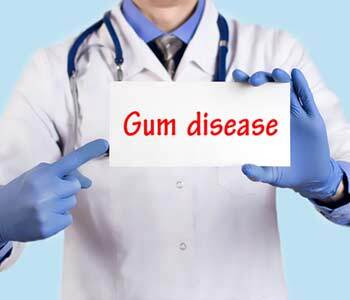 The direct cause of gum disease is aggressive forms of bacteria, living organisms that are natural to the oral environment. 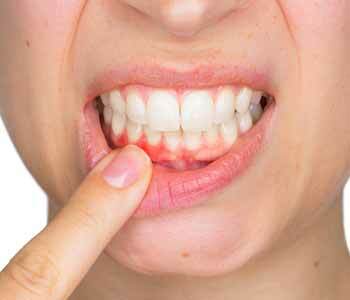 Indirectly, plaque and tartar buildup on teeth promote infection. Plaque is a sticky substance that you cannot see. It is a natural biofilm that adheres to enamel at the gum line. One of the primary reasons you are encouraged to brush your teeth often is because brushing inhibits plaque from remaining on teeth too long. Plaque that lingers eventually hardens into tartar. Both of these substances provide a safe haven for bacteria to thrive. At Kensington Dental Office, we provide a full-spectrum approach to gum disease. First, we recommend routine hygiene visits based on each patient’s needs. 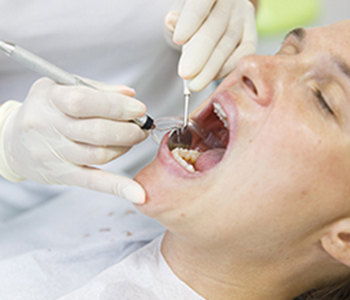 Some patients need frequent cleanings while others do fine with two a year. Depending on the severity of gum disease, we may also apply antibiotic medication or treat deep pockets of inflammation with our gentle soft tissue laser. Gum disease can seem to occur very quickly. For this reason, it is important to see your dentist regularly for check-ups and cleanings. Schedule your visit with our friendly team today to reduce your risk of disease.